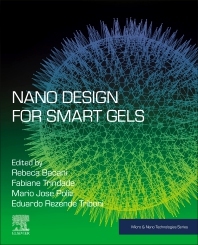 Nano Design for Smart Gels addresses the formation and application of technological gels and how nanostructural prospects are fundamental to gelling. Topics focus on the classification of gels based on small molecules and polymer gellers, biogels, stimulation conditions, topological, thermodynamic and kinetic aspects and characterization techniques. The book outlines structure and characterization concepts in order to provide pragmatic tools for the design and tailoring of new functional gel architectures. It provides an important source for readers and researchers who are currently or may soon be in research with gels, presenting an overview of fundamental topics. Rebeca Bacani has a PhD in physics and currently is a postdoc fellow in Engineering Chemistry department at Universidade de São Paulo College Engineering in Lorena (EEL-USP) in Brazil, former temporary professor in Material Engineering Department at EEL-USP. Currently, interests are in mesoporous nanomaterials and ceramics, inorganic nanoparticles, organics/inorganic gels, advanced X-ray based characterization with applications in catalysis and photocatalysis. Fabiane J. Trindade is based at the Department of Fundamental Chemistry of University of Sao Paulo, Brazil. Dr. Trindade research experience and interests include sol-gel synthesis, characterization, assembly and properties of novel controlled organic–inorganic hybrid nanostructured materials, such as mesostructured silica, graphene, aromatic imides, yolk-shell nanoparticles and photochemistry. Mário José Politi is Professor of Biochemistry at the Chemistry Institute of the University of Sao Paulo, Brazil. His current interests are in new materials, colloid polymers, silanes, siloxanes and nanostructured colloids. Mostly in the areas of Colloids, e Surfaces and Surfactants, Photo chemistry and Photo physics and Organic Physical Chemistry. Eduardo Rezende Triboni is currently a Professor of Organic Chemistry and Supramolecular Chemistry at the Chemistry Engineering Department of the School of Engineering of the University of Sao Paulo, Brazil. His current interests are in chemistry of materials, colloids, naphthalimides, silsesquioxanes, nanoparticles and nanostructured colloids.